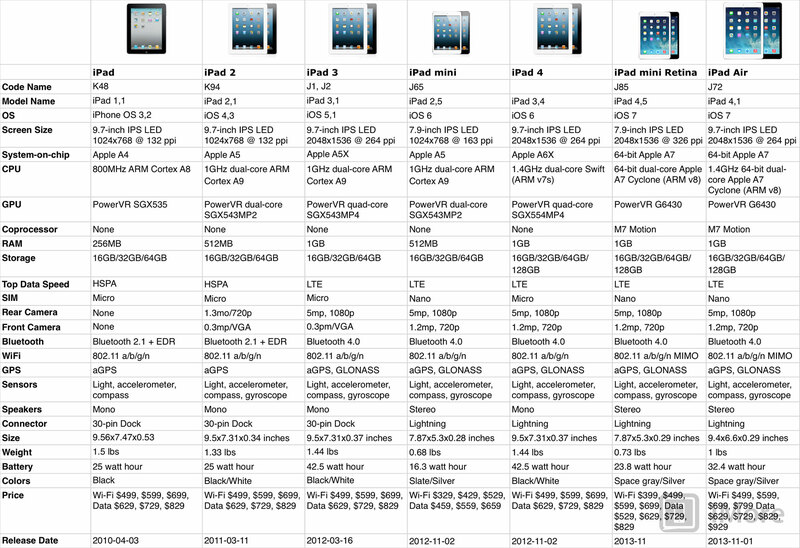 Complete review of Apple's new Retina-display equipped, 64-bit, 7.9-inch tablet. In 2012 Apple took the year-old 9.7-inch iPad 2, condensed it down to 7.9 inches, and re-launched it as the new iPad mini. Every inch an iPad, yet one of stark contrasts - a design from the future wrapped around technology from the past. It had an Apple A5 processor in the age of the Apple A6, and a 1024x768 standard density display in an age of 2048x1536 Retina. Still, for many, the lack of size mattered. Smaller, thinner, less expensive, and, most importantly, lighter than any iPad before it, the mini quickly found its way into pockets, purses, and hearts. It was such an incredibly good tiny tablet that otherwise incredibly discerning people - people who vowed never to go near a standard density display again - forgave it its shortcomings, even if its chunky pixels never let their eyes forget it. Enter the 2013 iPad mini with Retina display. Ever-so-slightly thicker, ever-so-slightly heavier, it manages to pack the full 2048x1536 resolution into an even higher density screen, and skips an entire processor generation to do it. Apple A7 powered, 64-bit, it appears atomically identical in almost every way to the iPad Air. Small wonder indeed... or is it? Note: In October 2014, following the introduction of the iPad mini 3, Apple renamed the iPad mini with Retina display to the iPad mini 2, dropped the 64GB and 128GB options, and dropped the starting price to $299. The iPad mini with Retina display ships in the same type of package as the original, and the box contains the usual Apple pamphlet, the USB to Lightning cable for charging and connecting to a Mac or Windows PC, and the USB power adapter for connecting to an outlet. Physically, the new iPad mini 2 is almost identical to last year's original. Same minimalist design, same incredible craftsmanship. It does differ, however, ever-so-slightly in thinness and weight. The original iPad mini was 0.28 inches deep. The Retina is 0.29 inches. The original iPad mini Wi-Fi was 0.68 lbs. The Retina Wi-Fi is 0.73 lbs. That's because of the double density display and the bigger battery it necessitates. In every day use, the difference in thickness is unnoticeable. Whether or not the difference in weight is noticeable depends on how sensitive you are. 23 grams is roughly equivalent to 9 U.S. pennies, 20 paperclips, or, you know, life force. I can only tell the difference if I hold both an original and a iPad mini 2 at the same time, and it hasn't aversely affect my usage at all. If the weight of the original iPad mini was already borderline for you, however, it's something to consider. One of the two color options has also changed, at least on the backplate. Last year Apple launched the original iPad mini in silver and white, and slate gray and black. Slate, like any color approaching black, proved difficult to anodize and was susceptible to scratches and chips, however, so just like with the iPhone 5s and iPad Air, the new iPad mini 2 has been switched a lighter space gray (the politically correct term or gunmetal gray). The faceplate has stayed just as black and just as glossy as ever. The bigger deal - or rather the smaller one - is that the iPad mini 2 retains the original design at all. Sure, Apple handled the same transition from iPad 2 to Retina iPad 3 in the same way, but they had a much larger chassis to work with. It took them an extra year to pack that display into the iPad Air, and those same technological advances make it possible to pack Retina into the iPad mini now. From 2010 to today, the evolution is remarkable. The tiny increase in thickness and weight - or thinness and lightness if you prefer - will likely disappear in the future, but they do nothing distract from the accomplishment of the iPad mini design, or this device today. Retina display is the marquis feature of the new iPad mini; it says so right in the name. A marketing term adopted by Apple, Retina means the display density is high enough that, when held at a normal viewing distance, individual pixels disappear and all someone with 20/20 eyesight can see is the content. This happened in print media decades ago, it happened with the iPhone in 2010, the full-sized iPad in 2012, and now the iPad mini in 2013. Apple's method of moving a standard density iOS device to retina remains unchanged with the iPad mini - they double the pixels both horizontally and vertically, resulting in four times as many pixels in the same physical space. In other words, take a standard pixel, divide it into four, and you have Retina pixels. So, if you see something small on the screen, even a simple shape like a circle (left), instead of the cruder, standard density (middle), you get the much finer Retina result (right). That translates into crisper text, cleaner lines, and sharper images. The original iPad mini's 1024x768 @1x screen becomes 2048x1536 @2x on the Retina, and its original 163ppi density becomes 326ppi. If those numbers sound familiar, they should. The iPad mini 2 now has the same raw raw pixel count as the 9.7-inch iPad Air (and iPad 3 and iPad 4 before it). Because the iPad mini is only 7.9-inches, however, it enjoys the same pixel density as the iPhone 5s (and every iPhone before it, going back to the iPhone 4.) Here's a comparison between resolution and density, for the iPad mini (red), iPad mini 2 (green), iPad 4 (blue), and iPhone 5 (purple) (from left to right). I've added 44x44 point squares (standard tap target size in iOS) over the screens, so you can see how the absolute pixel and touch sizes (top) change when the displays are at physical scale (bottom). Otherwise, the iPad mini 2 retains the same 4:3 aspect ratio as the original, as well as its fingerprint resistant oleophobic coating, its bright, LED backlight, and its excellent viewing angle, thanks to in-plane switching (IPS). Unfortunately, Apple has kept the narrower color gamut display of the original iPad mini. Visually, that translates into less saturated reds. It's most noticeable when viewed side by side with a wider-gamut panel, like the iPad Air. For most people, especially people exclusively on an iPad mini, it likely won't even be noticeable. For those with both a full sized Retina iPad, as well as photographers, digital painters, and those with especially keen color sense, it could prove irritating or even a show-stopper. If wider color gamut is important to you, consider an iPad Air instead. If not, you'll be perfectly happy. There have also been some reports of image retention on the iPad mini 2. It hasn't been an issue with any of the models we've tested, but Apple typically draws upon multiple panel suppliers so it could be restricted to only one of them, or only one batch. If you experience the problem, exchange your iPad with Apple. Even so, difference between an original, standard density display, and a new, Retina display, is as striking as ever. Here's how it translates into icons, the App Store icon to be specific. iPad mini 2 (top left), original iPad mini (top right), iPad Air (bottom left), and iPhone 5s (bottom right). Graphics in general, including words bubbles on comic books, are similar. iPad mini 2 (top left), original iPad mini (top right), iPad Air (bottom left), and iPhone 5s (bottom right). Text and other thin, small shapes benefits most of all from the higher density display. iPad mini 2 (top left), original iPad mini (top right), iPad Air (bottom left), and iPhone 5s (bottom right). So, after all that, we're left with a iPad mini 2 that has all the pixels of the iPad Air and all the density of the iPhone 5s, but the same narrow color-gamut of the original iPad mini. While it doesn't take away from the sharpness and clarity of the display, or the overall achievement of the device, it does show that even after Retina, there's still room left for improvement. Last year the original iPad mini became the first iOS device to score stereo speakers, a feature the iPad mini 2 retains. This year, like the iPad Air, the iPad mini 2 gains twin microphones. It should allow the Retina mini to record better audio thanks not only to double the possible vectors, but because it can now do noise cancellation as well. That'll help with Siri and FaceTime as well. It's not quite up there yet with the iPhone's 3 microphone beam-forming, but it's much better than before. The iPad mini 2 is powered by the Apple A7 chipset. It's a custom designed dual-core, 64-bit, ARMv8-based CPU called Cyclone paired with a PowerVR series 6 GPU with support for OpenGL ES 3.0 (likely the G6430). Clockspeed is 1.3GHz, same as the iPhone 5s, but 100MHz less than the iPad Air's 1.4GHz. It's a 7% difference, which won't be noticeable to most humans, most of the time. That's especially true if you're coming from the original iPad mini, which used the much, much less performant Apple A5 processor. Skipping two processor generations - leaping over the Apple A6 and going straight to the Apple A7 - is what makes the iPad mini 2 possible. Previously, Apple needed the extra GPU power of the A5X and A6X to drive the 2048x1536 display in the iPad 3 and iPad 4 respectively. Neither wouldt work with the size - and hence thermal and battery - constraints of the iPad mini. Thanks to the A7, Apple has all the power they need, in a much more efficient package. And it shows. The difference between the iPad mini 2 and iPad Air is negligible. The difference between the iPad mini 2 and original iPad mini is astonishing. Perfunctory benchmark time, iPad mini 2 (left), original iPad mini (middle), iPad Air (right). Though there have been some complaints of sluggish performance on the iPad mini with iOS 7.0.3, I've not found that at all. Doing the same tasks on identically set up iPad mini 2 and iPad Air, yields the same performance. That's been consistent across several devices. Given the similarity in hardware, that's to be expected. More importantly, using the Apple A7 means the iPad mini 2 will be a first-class citizen when it comes to the next wave of 64-bit apps and Open GL ES 3.0 games. Where the original iPad mini was bound to the Apple A5 past, the iPad mini 2 is set for the Apple A7 future. When I reviewed the iPad Air earlier this month I complained that, thanks to Touch ID on the iPhone 5s, it now took me over 10 seconds to unlock the iPad. 8 of those to remember there was no Touch ID on the iPad, and to curse about it. That hasn't changed with the iPad mini 2. If anything, it's gotten worse. I use the iPhone 5s constantly, so Touch ID has become muscle memory. I just expect it to be there. So, when I feel a one button, and it doesn't have Touch ID, it's maddening. I'm sure Apple feels the same way, and if they could produce Touch ID chips fast enough to meet iPhone demand, and faster still to extend it to iPads, I think they would. They can't, however, so they didn't, and here I am still entering Passcodes like it's 2012. It's a first nerd problem of the first degree, to be sure. If you don't have an iPhone 5s, you won't even notice Touch ID is missing. (You probably want to print out this section, roll it up, and hit me with it.) If you do have an iPhone 5s, however, you will, and you'll be thinking 2014 can't get here fast enough. The iSight camera in the Retina mini is the same 5 megapixel, backside illuminated (BSI), five-element, hybrid IR, f/2.4 aperture as the original. What has changed is the Apple A7 processor, and the image signal processor (ISP) inside it. It's two generations ahead in terms of imaging technology, which includes smarter auto white balance, focus, exposure, face-detection, and more. In daylight, when the sun is flooding it with photons, there's not much if any difference. When it comes to low-light, however, the A7 ISP pulls a little more detail out of the darkness, same as the iPad Air, but certainly nowhere near as good as the superior optics in the iPhone 5s. For macros, the the A7's ISP again produces noticeably better results than last year's original iPad mini, on par with the iPad Air. While noisier than the more powerful iPhone 5s camera, thanks to annoying glitches that remain in the iPhone macro focus system, the iPads manage to resolve their photos better as well. High dynamic range (HDR), which merges multiple exposures to pull more detail out of both highlights and shadows alike, varies little across the board. The iPad mini 2 and iPad Air are slightly better than the original iPad mini, but not exceptionally so. Even the iPhone 5s, while producing much larger, much cleaner images, doesn't pull staggeringly more image information. Video is the same story. In daylight, there's no difference. In low light, it's better but still noisy, especially compared to the iPhone 5s. Dual mics do make for better audio quality, but likewise arent up to the same standard as the triple mics and beam-forming in the iPhone 5s. Also, unlike the iPhone 5s, Apple doesn't surface Panorama, Burst, or Slo Mo modes, or real-time filters in the Camera app. You can still take up to 10 photos a second by holding down the shutter button, you just don't get the real-time processing and fancy image selection interface. You can also add iOS 7 filters in post via edit mode, but the loss of real-time is a shame. For some people the iPad is their only camera-equipped device, and their moments and memories are every bit as precious. Apple knows how to make great mobile cameras, all that remains is for them to put one on the iPads. Like the rest of the new iOS devices released this year, the iPad mini 2 gets a slightly improved FaceTime HD camera. It's still 1.2 megapixel f/2.4 and 720p like the original iPad mini, but it's gone from 1.75 to 1.9 microns and switched to a back illuminated sensor (BSI). In daylight, there's no discernible difference. In low-light, however, it's an improvement. Apple keeps an updated list of the countries and carriers with official iPad LTE support. In my tests, I've gotten just about the best LTE results I've ever gotten using the iPad mini 2. Up to 95Mbps on-device, and around 85Mbps on average. That's more than twice as fast as the iPhone 5s on the same network at the same location. So, either there's something fishy about the tests, the carrier is provisioning iPads for faster access than iPads, or... I don't know. I'm not looking a gift half-hundred megabits in the mouth. Tethering hasn't been quite as fast on the iPad mini 2 as it was on the iPad Air, averaging between 60 and 70Mbps, but again, that's likely due to the vagaries of cellular networks more than any difference between radios. Batter performance for tethering, like all iPads, has been spectacular. It goes all day. U.S. Assisted Global Positioning System (GPS) and Russian Global Navigation Satellite System (GLONASS) remain exclusive to the cellular iPad models. Like the iPad Air, the iPad mini 2 has multiple-input and multiple-output (MIMO) Wi-Fi. That means there's support for multiple antennas for both transmission and receipt, and the iPad can intelligently choose between them to not only ensure the best signal possible, but theoretically up to twice the speed. Unfortunately, also like the iPad Air, the iPad mini 2 doesn't have state-of-the-art 802.11ac Wi-Fi, which Apple does supports with the Mac and with their Airport routers and Time Capsules. 802.11ac isn't widespread yet, but it would help with race-to-sleep, letting data transfer quickly so it can power down quickly. If it was an either/or choice, MIMO will likely help more people more of the time, and hopefully next year will provide for both. There's still no near-field communication (NFC), though that remains more chipset than feature set at this point. If and when it changes, Apple will need to change with it. Meanwhile, Bluetooth is still 4.0 Low Energy (LE), which isn't a problem because that's as high as it goes for now. It's what Apple does with it, including direct device setup, game controllers, iBeacons, and more, that'll be the most telling. Roughly a year before the iPad mini 2 launched, Apple hit the reboot button on iOS, the software that would run it. After half a decade of richly textured design, Apple stripped their interface down to nothing, and then carefully, selectively, built it back up into something... different. iOS 7 now runs on top of a physics and particle engine that allows elements to interact - to fly, to bounce, to collide - in a playful, delightful manner. Thanks to consistent layering and translucent blurs, there's a sense of depth but also of context. Absent the felt and wood and leather of the past, typography and color palette are relied on to provide clarity and differentiation. And, as much as possible, the interface itself tries to get out of your way, deferring to the needs of the apps, and the apps to the content. It was a big, bold leap on Apple's part, but they haven't yet stuck the landing. All change is divisive, yet iOS 7 on iPad even more so than the iPhone version. The original iPad launched in 2010 running iPhone OS 3.2. It was born into a world already defined by the smaller screen. iOS 7, for the first time, allowed Apple the chance to consider the iOS interface in post-iPad world. Does that mean iOS 7 is more at home on the big, multi-column tablet than ever before? Or does that mean, in their rush to ship, it's an even worse stretching out of the phone interface than previous versions? Opinions vary, and there's no doubt some elements of truth in both. iOS 7 seems better suited to the iPad, yet it also seems less fully realized. The beta of iOS 7 for iPad, famously, shipped two weeks later than the iPhone version, and seems to have struggled to keep up since. In a few months, in a year, this won't matter. For now it does mean, once and a while, you'll catch it struggling to keep its balance. iOS 7 and apps in general on the iPad mini 2 look and work exactly the same way as on the iPad Air, and all previous generation iPads. However, because the iPad mini is physically smaller - 7.9- vs. 9.7-inches - iOS 7 and apps in general are physically smaller on its display as well. That means everything from text, to pictures, to the interface elements you need to tap, are all physically smaller. Technically, where you can fit only 264 pixels per inch on an iPad Air, you can jam 326 of them on an iPad mini. Smaller pixels make smaller stuff. Here's how that looks at relative scale in the Settings app from iPad mini 2 (left) to iPad Air (middle) to iPhone (right). Because accuracy is dependent on distance (throw), the smaller screen of the iPad mini offsets the smaller target sizes of iOS interface elements to some degree. And because size is also dependent on distance, you can hold the iPad mini closer to make text and images look bigger. iOS 7, however, adds an additional option, called Dynamic Text. Thanks to the new Text Kit framework, you can now go into Settings and increase the size of type at the system level. Sadly, it doesn't change every bit of text on the screen, and App Store apps have to work, in some cases hard, to use it, but if you're concerned about the size of body text in iOS in general, Dynamic Text should go part of the way towards alleviating that concern. There's still no Weather, Stocks, Compass, Calculator, or Voice Memos apps for iPad, and still no FaceTime conference calls - or similar, enhanced-for-iPad features - to take advantage of that big, beautiful screen. Yet, as reboots go, iOS 7 is a good one. While some elements clearly need a lot more work, others are already hauntingly beautiful. iOS 7.0.3 is the version that launched with the iPad mini 2. iOS 7.0.4 is already available, and iOS 7.1 just went into beta. It's only going to get better. While there are a several things I'd like to see from OS X Mavericks brought over to the iPad, it's clear with iOS 7 that Apple understands the iPad isn't a Mac. Other vendors still try to compete by misappropriating PC features for tablets, and advertising just that. While geeks love that stuff, its absolutely anathema to the mainstream. PCs are intimidating, inaccessible, and off-putting for the vast majority of humans on this planet, and those are exactly the people Apple is trying - and succeeding - to reach with the iPad. I'd love to see more, of course, but not through regression or concession. Better natural language, smarter visual parsing, prescience, and push interface all have their place in the post-PC world. I want them now. But I'm patient enough to wait for them to get done right. In the mean time, Apple's sticking to their focus means an iPad can't do everything a Mac can do, but many will be able to do far more with an iPad than they ever could with a Mac. It's impossible to overstate the size of that win. Just like the full-sized iPad Air, the iPad mini 2 is compatible with almost all of the one million plus apps in the iOS App Store, just under half of which are specifically designed for, or have alternative interfaces specifically optimized for, the iPad. That's not only far, far more tablet apps than any other platform, it's astronomically more. Not all of those apps are fantastic, of course, but there are several fantastic apps in every category at least. That includes indie Mac developers like The Omni Group (OmniOutliner, OmniPlan, OmniGraffle, etc. ), dedicated iPad developers like 53 (Paper), big game studios like EA, and even competing platform makers like Google, Microsoft, and BlackBerry. There's also Apple, who not only offers all the built-in apps, but many additional apps, for free, on the App Store, including iBooks, Podcasts, iTunes U, Find my iPhone, Find my Friends, Remote, and now Apple Store as well. The iPad's software lead, therefore, is not only or most importantly one of breadth, but of depth. With the launch of the iPad Air and iPad mini 2, Apple has also made their entire iWork and iLife suites free as well. They include some of the best mobile apps ever made, and are compatible with their Mac and iCloud.com counterparts. The suites include Pages for documents, Keynote for presentations, Numbers for spreadsheets, iPhoto for images, iMovie for video, and GarageBand for audio, and they significantly increase the value proposition of the iPad. Like iOS 7, App Store apps on the iPad mini 2 are identical to those on the iPad Air, though smaller due to the difference in physical size. Again, smaller distance means higher accuracy, so functionally most people won't notice a difference. The Retina display makes even small writing legible, which wasn't the case on the original iPad mini. However, small, legible text is still small. The difference isn't extreme, and Dynamic Text can work wonders for body content. However, for some people, the smaller size should absolutely be a consideration. 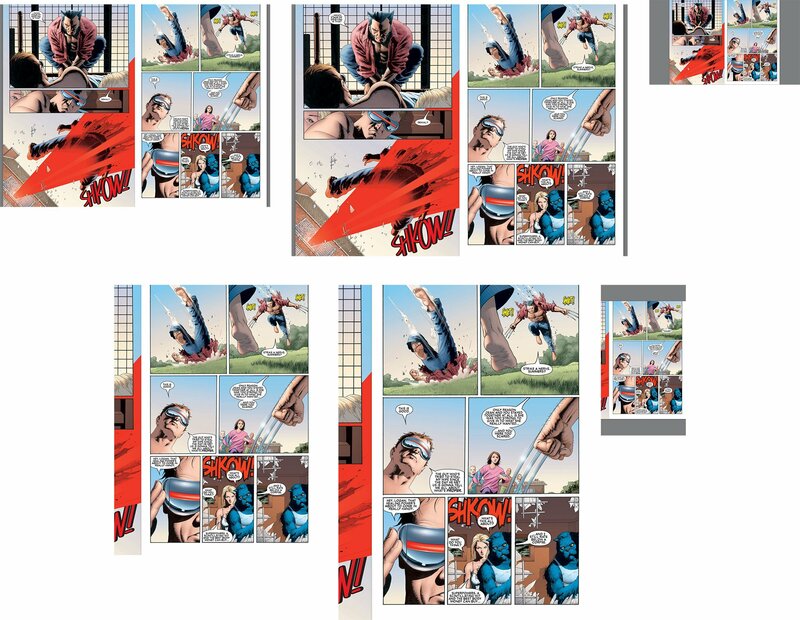 Here's what a comic book looks like in iBooks, in landscape (top) and portrait (bottom), at 326ppi on the iPad mini 2 (left) compared to 264ppi on the iPad Air (middle), with the iPhone - also 326ppi but with a much smaller 4-inch display - thrown in for good measure. Obviously, reading a single page at a time in portrait orientation offers the biggest, best experience. It's roughly equivalent to reading in landscape orientation on the iPad Air. A double page spread in landscape isn't that far behind, experience wise. The Retina screen makes for crisp letters and lines, and gorgeous colors. (Yes, Superman's bright red cape looks just fine, thanks.) My eyesight is terrible, and I can read them perfectly well in both orientations. In fact, I generally read in landscape, even on the iPad mini. I've been doing that exclusively for the last week and I've had zero problems. I do prefer comics on the iPad Air, because it's closer to actual comic book size, but the iPad mini 2 is far more portable. If that sounds like the same tradeoff as always - portability vs. screen size - it's because that's just exactly what it is. I use Paper by 53 all the time. I used to draw every day, for ours of day, all through my childhood, and I still sketch as much as I can today. On the iPad Air, it's a big sheet I can really go to town on, but on the iPad mini, it's a small book I can keep with me and use any time. That's what it comes down to, consistently. Anything you can do on an iPad you can do on an iPad mini, just in a smaller but more portable form. For some apps, like photo editing, drawing and painting, perhaps even coding and calculating, you'll benefit from the bigger size. If you want to take it with you, however, you'll benefit from the iPad mini's greater portability. iCloud comes free with every Apple device, including the new iPad Air. It lets you wireless backup your data to Apple's servers, and wirelessly restore it if you ever need to re-install iOS or switch devices. iCloud also lets you re-download anything you've bought on iTunes, the App Store, or the iBookstore, including music, movies, TV shows, apps, games, and iBooks. Photo Stream keeps recent photos both safe and available on all your Apple devices, as Documents in the Cloud does with your files. iWork for iCloud will let you access iWork documents specifically from any computer with a modern web browser installed. There's a free version of the currently U.S.-only iTunes Radio service, as well as the paid iTunes Match music locker service. If you want additional iCloud storage, it's expensive but you can buy it. Apple Stores, especially when combined with iCloud, whether extended by AppleCare+ or not, provide remarkable customer support for iPad Air owners. Apple specialists can help you test a tablet to make sure it's what you want, help you set it up, teach you how to use it, and if anything goes wrong, help you fix it. It's a feature not always included on competitive checklists but anyone who's ever needed to avail themselves of it knows just how important a feature it is. Thanks to Apple keeping the same basic form-factor as last year's original, the iPad mini 2, even with it's extra 0.01-inch in thickness. If you have an especially form-fitting or wrap-around previous-generation case, it might be too tight, but most should fit just fine. Apple has, however, released newly updated Smart Covers and Smart Cases for the iPad mini 2. Cosmetically, they're identical to the iPad Air Smart Covers and Smart Cases. Likewise, all of Apple's Lightning adapters, USB, SD, HDMI, and VGA and their Bluetooth Keyboard are compatible, as are almost all third-party Lightning and Bluetooth adapters, keyboards, and other peripherals. The iPad mini 2 comes in four capacities, 16GB, 32GB, 64GB, and 128GB. They start at $399 for 16GB and max out at $699 for 128GB. Add in the $130 cellular option, and it becomes $529 for 16GB and $829 for 128GB. Due to supply constraints, however, the iPad mini 2 is currently only available via the online Apple Store, by reservation for pick up at Apple Retail, and through authorized resellers when and if they have stock. Update: In October of 2014, Apple released the iPad mini 3, and dropped the storage capacity options and price of the iPad mini 2 to 16GB and 32GB for $299 and $399, or $429 and $529 with cellular, respectively. Last year, despite its lack of Retina display, despite its lack of a modern chipset, the iPad mini's ultra-compact form factor won the hearts and pockets of many. It was just so utterly convenient that many of us simply didn't care. 2011 tech that it was, it became our 2012 iPad of choice. Yet it was always caveated. It was always in spite of as much as because of. No longer. Yes, the 2013 iPad mini with Retina display is ever-so-slightly thicker and heavier, yes its 2048x1536 Retina display is ever-so-narrower in gamut, yes its Apple A7 chipset is ever-slower in clock speed. Compared to the major concessions of last year, which few regular humans even noticed, the concessions of this year, for most people, are all but laughable. It's become trite and cliched to say "this is what the original should have been!". It implies a stillness and finality to what is fluid and ongoing. Technology marches inexorably forward. The iPad mini will get thinner again. It will get more colorful. It will get Touch ID and other new features Apple's already working on and we're yet to imagine. That will be then. This is now. The 2013 iPad mini 2 improves the most important things about the original in the most important ways. It's not perfect. Nothing is. But it is, at last, every inch a modern iPad, and a small wonder indeed.